The smart way to get real spring reverb without buying a whole amp. Real spring reverb in a pedal; two different settings; 9V operation. Battery compartment cover could go walkies. The HeadRoom is about the same size as two Big Muffs placed side by side. The HeadRoom offers two footswitchable depths of analogue reverb. There are plenty of digital pedals around that aim to emulate the sound of spring reverb. Many of them, it has to be said, do an extremely good job of it, but for some players it has to be the real thing in all of its electro-mechanical glory. So, if that's you, how do you go about adding spring reverb to your rig? Well, you can target an amp with a built-in spring, assuming that the rest of that amp's sound and features are to your taste and that you can actually justify a change of amps. Then again you can add the daddy of them all to your existing set-up - a standalone Fender Spring Reverb - but that's going to be expensive and maybe just a little inconvenient for onstage use. "Sound-wise it's the real deal… the HeadRoom is an ideal way to add real spring reverb to your rig." The third way is to buy a real spring reverb in a pedal - conveniently at your feet and always ready for action. 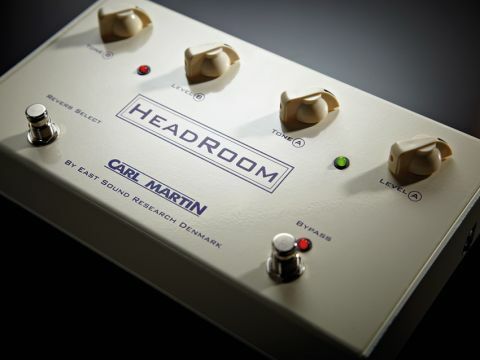 By necessity, any spring reverb pedal would have to be a pretty large to fit those springs in but the HeadRoom, the latest from Carl Martin, is not excessively large, being about the size of two Big Muffs side-by-side. What's more, it can run off a PP3 or a standard 9V adaptor, saving even further on pedalboard space. A single input and output unit, the HeadRoom helpfully offers two reverb depths (A and B), each with their own chickenhead knobs controlling tone and level. Two nicely spaced footswitches take care of all the action - one to bypass the unit and the other to switch between sounds A and B. Alternatively, if you want to put the pedal somewhere safe, you also get the facility to add remote footswitches to take over the switching duties. An Accutronics three-spring unit similar to those found in smaller Fender amps is at the heart of the HeadRoom, and the sound is familiarly Fender-like. Generated from the same springs, the A and B reverbs are identical, the differences between the two being totally dependent on knob positioning. The level knob takes you from a totally dry sound through to a deep surf twang and all points in between, while turning the tone knob clockwise adds in top end for more brash, splash or trash, depending on your perspective. This is quality reverb that functions as an organic part of the overall guitar sound rather than something just tacked on, and with two 'presets' always on tap you can swiftly transition from an ambient aura to something that's a deliberate 'effect'. Like any Fender amp with the reverb turned up, if you give the HeadRoom a kick you'll get the usual thunderclap clang - and we were initially concerned that we'd get that just by stomping on a footswitch. The designers, though, have done their level best to minimise that happening by suspending the spring tray inside the HeadRoom's chassis for extra isolation and fitting thick rubber feet on the pedal's base. The result is that if you are reasonably gentle with the footswitch there's no problem, but if the level knob is above halfway and you stomp on the switch a bit too hard you may get an audible muffled thump through the amp. It's no big deal, though, and anyone with persistently clumsy feet can always add a remote switch. Sound-wise it's the real deal, and if you don't mind it taking up the space of two or three conventionally sized pedals on your 'board then the HeadRoom is an ideal way to add real spring reverb to your rig (if underfoot size is an issue you can always stick it on top of your amp and use a couple of small remote footswitches). While there are other spring reverb pedal options out there, the HeadRoom's practicality, realistic pricing and availability are likely to make it the popular choice for anyone who wants some genuine retro shimmer and twang.